सम्राट कोन्स्टान्टिन प्रथम इस चर्च के पच्चीकारी में, मैरी और बाल मसीह को श्रद्धांजलि देने हेतू कांस्टेंटिनोपल शहर का प्रतिरूप प्रस्तुत करते हुए। हागिया सोफिया, 1000 ई. ↑ अ आ Mango, Cyril. Constantinople. पपृ॰ 508–512. ↑ Commemorative coins that were issued during the 330s already refer to the city as Constantinopolis (see, e.g., Michael Grant, The climax of Rome (London 1968), p. 133), or "Constantine's City". According to the Reallexikon für Antike und Christentum, vol. 164 (Stuttgart 2005), column 442, there is no evidence for the tradition that Constantine officially dubbed the city "New Rome" (Nova Roma). It is possible that the Emperor called the city "Second Rome" (यूनानी : Δευτέρα Ῥώμη, Deutéra Rhōmē) by official decree, as reported by the 5th-century church historian Socrates of Constantinople: See Names of Constantinople. 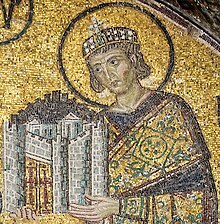 Byzantium 1200, a project aimed at creating computer reconstructions of the Byzantine monuments located in Constantinople as of the year 1200 AD.